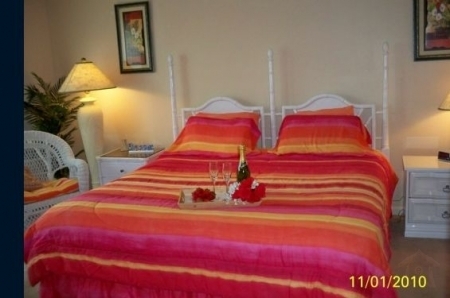 Just steps to the Beach, this delightfully decorated, 2nd floor vacation rental condo, is 210 in the Beachview Condominium Complex. This compound has its own private dune crossover to the beach. It also has a large pool, tennis court and reserved parking. Beach Bliss is a spacious 2 bedroom, 2 bath condo that comfortably sleeps 8, with 1 King, 2 Full sized beds, and a full sized futon. This unit has everything you need and may want like, Free Wireless High Speed Internet, Air-condition, Heating, Linens, 3 TVS with cable, VCR's, DVD, Radio / CD player, Tennis Rackets, A fully equipped Kitchen with dishwasher, microwave, coffee maker, blender etc. It also has a large balcony overlooking the pool and tennis court and a view of the Sound, Laundry room with full sized Washer and Dryer, Iron and much more. Military families and returning guests receive a 10% discount! Check out the availability calendar for dates available, and let me know which dates you would like. Rental limitations: No Smoking and no pets allowed. All rentals are limited to families or mature adults. 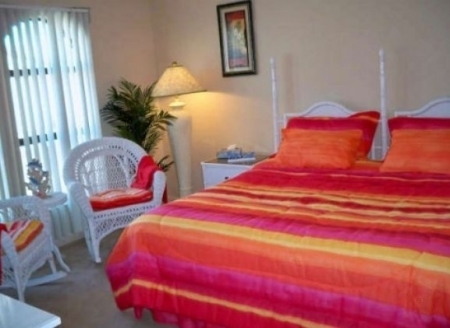 \"Beach Bliss\"... quiet, clean and comfortable with miles of walking, jogging and bike trails just out the door as well as the beautiful soft white beach sand but a few steps away; the perfect combination for a relaxing vacation. Great location, away from spring breakers. A well enjoyed month\'s vacation. We had a wonderful stay in this great condo! It is roomy and very comfortable. 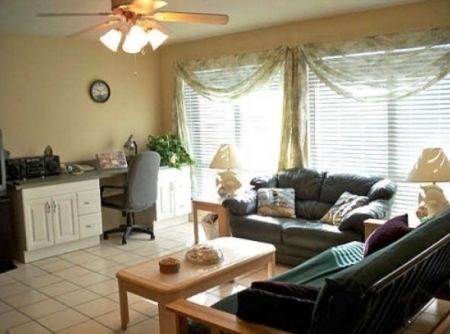 Very clean and quite with great access to the beach. It had everything we could need including toys for building sand castles. If we have the opportunity to stay on the beach again, this is the place we will do it!!!! Fabulous! If you are looking for a quiet place to spend some time. .THIS IS IT!!! The condo was bigger than we expected! Well stocked and just a few seconds from the beach! And Navarre Beach is stunning! We had never been to this part of Florida and were very surprised! 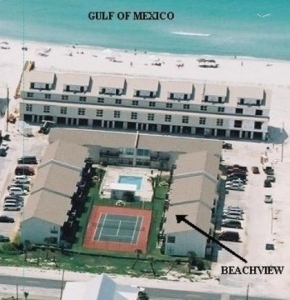 It\'s a family beach and quiet but a short drive to Destin, Ft Walton and Pensacola Beach for dining and adventures. The condo was very roomy and furnished with everything we needed. We never heard a peep from anyone around us.The complex was very quiet. Checking in after hours was a breeze and the owner was very friendly and answered questions about the area. We will be back to visit Navarra Beach! Family stayed at Beach Bliss March 13-20, 2010. It was far enough away from most Spring Break college students, so nice and quiet. Beach was super windy first two days, then beautiful thereafter. Soft white sand was excellent for relaxing and playing. Found a few cool shells. Small pool (cold this time of year), but nice pool area for when it warms up a bit. Nice tennis court also, both right outside the balcony. Nice sleeping arrangements (all our boys in the room with two doubles, and us in the king bedroom). Walking / biking path right out front. 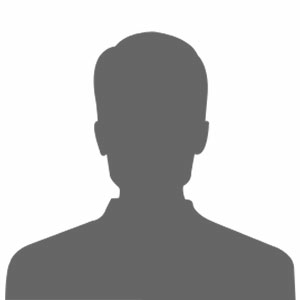 Short drive to Pensacola or Fort Walton / Destin area where there\'s more shopping, activities. We enjoyed our stay. It was nice to have 3 TVs for watching different programs at night. Dishwasher, microwave, washer/dryer all convenient for the week. I loved this condo!!! It is absolutely the best one in the entire Beachview and Sugar Beach complex. Fantastic and cheap! So much personal detail that it makes you feel like your home. Don\'t change a thing.